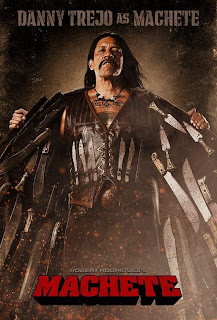 Troublemaker Studios have released a new set of character posters to promote their upcoming release Machete (a character made famous from a variety of Robert Rodriguez’s previous movies including the Desperado series). The first poster featuring Danny Trejo as Machete looks pretty brutal and awesome. After the low-budget but imaginative trailer (in a Crank kind of way) that was released last week I was expecting something in the same vein. Yet this batch of posters seem fairly uninspired and very similar to the previous Rodriguez’s related films - Sin City, 300, The Spirit and most specifically Planet Terror. Even the font for both movie titles is exactly the same? Are the graphic designers getting lazy or do they just really just love this type face? The same thing happened following Sin City and 300, when The Spirit was released keeping with the noir feel and blood reds and again they used the same font for 300 and The Spirit. What’s going on? Do Troublemaker Studios get held up on a certain typeface that they have to use for several films in a row? Or are they hoping that consumers will subconsciously link the Rodriguez brand by using the same type face. Personally I think they should have taken a brand new approach to the look and feel, I mean every time Spielberg releases a new film he doesn’t use a look that is in a previous film.